Ralston Valley Beef raises grass and grain-finished cattle, selling its dry-aged and locally raised beef directly to individuals, restaurants, and specialty grocers throughout Colorado’s Front Range. 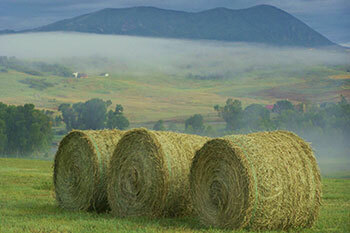 RVB's mission is to provide high quality ranch-direct beef in a simple, convenient, and responsible manner. We choose to not use any antibiotics on the cattle in our beef program and we don’t use any added growth hormones. While the company headquarters is in Arvada, CO, cattle can come from two ranches: one small family ranch located west of Denver provides hay production and summer pasture and the other, home to my long-time mentor and cattle partner, located southeast of the Limon/Hugo area which sources the cattle and provides additional pastures and finishing on locally grown grains. My wife and I (along with our three children) oversee summer grazing, marketing, processing, inventory, and delivery of our final product. My Mentor and his two sons oversee the cattle sourcing, additional summer/winter grazing, and grain finishing. While we have been custom processing cattle for ourselves, family, and friends for over 19 years, RVB has been in business as a stand alone company servicing individuals and restaurants since 2009. My parents started their small ranch in 1961. My Mentor’s ranch has been in their family for 4 generations. During summer months when we have cattle grazing at my family’s ranch, I check on the animals frequently making sure they are healthy, safe, and well taken care of. There’s always fences to check and repair, gates to maintain, irrigating the meadows, fighting weeds, and ensuring bears and mountain lions keep their distance! There’s always other miscellaneous ranch work that needs to be completed such as mowing, equipment maintenance, and the ever growing ‘To Do’ list. I haul cattle from one ranch to the other, and once they are finished to market weight, I transport each load to the processor - at least one load every month. Once the cattle have been processed, I transport the packaged beef from the processor to the warehouse where I then inventory and count each cut. Marketing, sales, and customer relations are an ongoing task. Whether it be website maintenance, promotions, sales calls to restaurants and specialty grocers, customer relations takes a lot of time and energy! I hand pack each order - whether it be for individuals, families, restaurants, etc... I then deliver each order in person. Then there’s the never ending pile of paperwork. Statements, invoices, bills, tracking sales taxes collected, financial bookkeeping, and other items are just some of the basics necessary just to keep the business running. Spending time with my family - my most favorite part of every day...and no doubt the most important part of my day! Our children love helping me do chores, checking on the cattle, and watching for wildlife. Another favorite time of mine is having the kids ride with me when I’m working in the warehouse or making deliveries. Having them take an active part in what I do each day makes me feel that I’m passing down valuable lessons to them - after all, they’re the reasons I’m doing what I’m doing for a living! Aside from being able to work outside with my hands, I enjoy the people, forging friendships, and helping provide a healthy food staple that everyone likes and desires! I have good memories getting to talk to several of my customers while helping them load up their freezers, or even having a cup of coffee with them after making a delivery. I also really enjoy my fellow cattle producers. They are upfront, honest, and eager to help teach me things. Business can be (and often is) done on a handshake and a person’s character still matters. That is the type of business in which I feel most fulfilled. Input costs and weather are always big challenges. Right now, drought is having a major impact on our ability to grow enough grass upon which to graze our cattle. Last summer, neither ranch had enough grass grow to graze which made us have to feed our cattle all summer - with a continued shortage of water and feed, our input costs have soared and have demanded a lot of man hours. This presents a challenge as we try to keep our beef prices affordable for our customers. Beef is a great choice for your table whether it is raised conventionally, naturally, organically, grass-finished, or grain finished. It is a naturally-nutrient rich food that is an important part of a well-balanced diet because it provides vitamins and nutrients that help strengthen and sustain your body. Beef is convenient. It can be prepared numerous ways - fitting most cooking styles and taste preferences. Whether it be a hamburger, casserole, roast, ribs, or a steak, beef’s versatility makes it a clear choice to nearly every consumer wanting a flavorful experience.